K-Pop superstar and Boys Over Flowers‘ Kim Hyun Joong graces Trinoma Mall tonight to promote his new album. Come and join the high-five craze as TriNoma and Polyeast Records give you the first-ever “high-five” experience in the country with the famous Asia’s pop star Kim Hyun Joong. 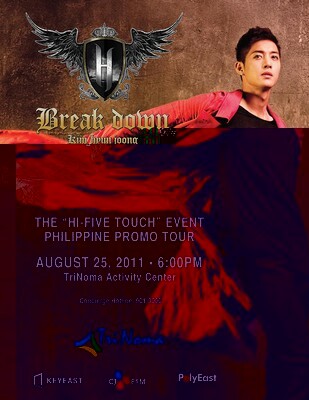 With the release of his first solo mini album “Break Down”, he will be at the Trinoma Mall tonight, August 25, for the Hi-Five Touch Event. Kim Hyun Joong would definitely like a high-five from you! All you got to do is buy a copy of his album at the event, hold your hand up in the air and share your happy and cool gesture to Kim as he visits Manila to high-five all his fans. Kim Hyun Joong debuts with the album “Break down” as he displays a different persona compared to his SS501 days. Hyun Joong has taken the most generic route out of all the SS501 member’s solo activities – typical synthesizer instrumentals, heavy beats and catchy choruses as well as bubblegum pop. Kim Hyun Joon‘s completed his tour both in the U.S. and South Korea and later on, hit back the studio and recorded this mini-album with album producer Steven Lee. Together with Japanese group, V6 and KAT-TUN’s producer Steven Lee, Kim Hyun Joong involved himself in the album-making just to reveal more of talent as a solo artist. “Break Down” boasts a total of six songs, with one instrumental version of the title track. The title track “Break Down” is a powerful synthesized song with an urban style which features a stylish rapping of South Korea’s Double K; and Ken Lewis (Eminem, Kanye West, Usher and John Legend) as the single’s producer. The music video for “Break Down” was simultaneously released with the single’s digital release. Aside from the Philippines, “Break Down” will also be released in South Korea, Mainland China, Taiwan, Hongkong, Thailand, Singapore and Malaysia. Kim Hyun Joong’s solo mini-album “Break Down” is now available at all record bars nationwide exclusively distributed by PolyEast Records in cooperation with KeyEast Entertainment and CJ E&M Korea.